For a long time, vertical video meant the recorder was either lazy or uninformed. It was seen as evidence that someone didn’t know the most basic rules of video production. Vertically recorded videos were grainy and poorly framed. They were videos that captured a fight behind the gym after school or a jerky shot of a concert that consisting mostly of the back of someone’s head, flashing lights and some inaudible screaming. They weren’t exactly flattering examples of vertical video. Here here I agree.... but wait what???? But when video is produced for consumption on social media, filming in a vertical perspective is an increasingly legitimate option. You don’t have to film in a vertical perspective, but writing off a video simply because it’s using a nontraditional aspect ratio ignores the changing landscape of video production and sharing. But now, when more people own smartphones than desktop computers, it might be time to realize that maybe vertical video isn’t just the tool of the lazy and uninformed. It’s not just smaller hobbyists producing vertical content. Music videos, in particular, have been quick to capitalize on non-traditional aspect ratios. Kendrick Lamar’s 2015 hit “King Kunta” was recorded in 1:1. Ariana Grande, Taylor Swift and Nicki Minaj have all released vertical versions alongside more traditional music videos. YouTube now includes vertically-shot advertisements for mobile devices. Even Netflix has embraced vertical video, featuring vertical previews of shows that play when browsing the platform on a phone or tablet. Upright video to me has all the cinematic thrills of looking through a keyhole. But oh well. Nobody ever said progress always led to improvement. After all, we've evolved into a people who speak into a device the will turn our words into text and send a message rather than just placing a phone call and speaking directly to a person. 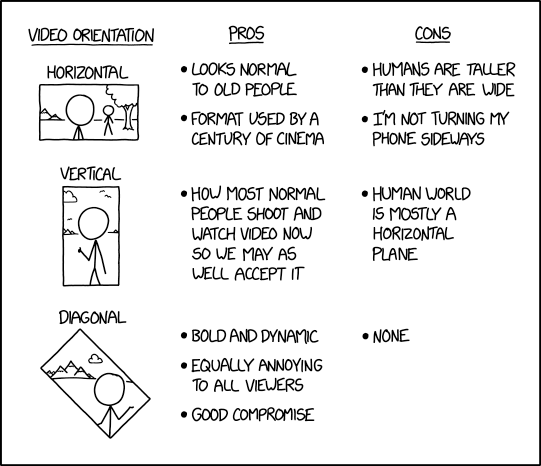 I'm hoping vertical video just a fad. Part of the problem is that clothing manufacturers have refused to change the aspect ratio of their pockets. If we watch and, for some of us, record most of our content on phones, what is the problem with vertical video? The problem is that it doesn't stay on the phone and isn't viewed exclusively on phones. Even if you never share with others, do you ever want to view it on your (horizontal) HDTV? Want to have your video of that breaking news story shown on TV (again, vertical on horizontal format) ? Do you post on YouTube or other sites where it can be viewed (on horizontal screens) by computers or an app on your smart TV or Roku? Clearly, there are situations where a landscape perspective is preferred. In a professionally-produced video, horizontal ensures your video can be viewed optimally on as many devices as possible. For a long time, vertical video meant the recorder was either lazy or uninformed...But now, when more people own smartphones than desktop computers, it might be time to realize that maybe vertical video isn’t just the tool of the lazy and uninformed. It appears that lazy or uninformed is still an issue. Knowing that many people don't bother to turn their phones, many companies are producing vertical video and ads targeting social media. And, that's certainly legitimate and makes good business sense. But, it's kind of a Chicken and Egg thing. Kodak had a line of pocket cameras that always recorded in landscape mode even if the camera was in the vertical position. Other manufacturers could do the same with their cameras. Some phones have options to lock the orientation. How about no matter what angle you hold the camera, it always records in a certain aspect ratio and angle -- by way of a miniature gimble inside the phone where the sensor rotates. RJ Johnston wrote: Kodak had a line of pocket cameras that always recorded in landscape mode even if the camera was in the vertical position. Other manufacturers could do the same with their cameras. I can just imagine the objections to that if there was not an option to turn it off. Actually, the Kodak pocket camera was suppose to be held vertically. If you held it horizontally, the video would be landscape, but the ground would be on one side of the short ends. It worked like a regular camera, except it looked like a smart phone. I used two of them for 3D stuff. Humans are taller than they are wide. Yes - TVs and PCs last longer than phones - but given a 2 year lifespan of a phone that's 13 years of TV shipments (I think). Maybe I am out of sync with the world but I (and quite a lot of folk that I know) are still using older phones (a Samsung Galaxy S4 in my case) and similar venerable Apple handsets. My S4 does all that I want/need it to do but I might replace it when the UK roll out of 5G has gained some traction. I had a Note 2 until yesterday and finally upgraded. I was tired of some of my favorite apps not being updated or able to run anymore. I can't believe how slow my old phone was compared to the new one, it is amazing. It takes me half the time to check email and other things on my phone now.